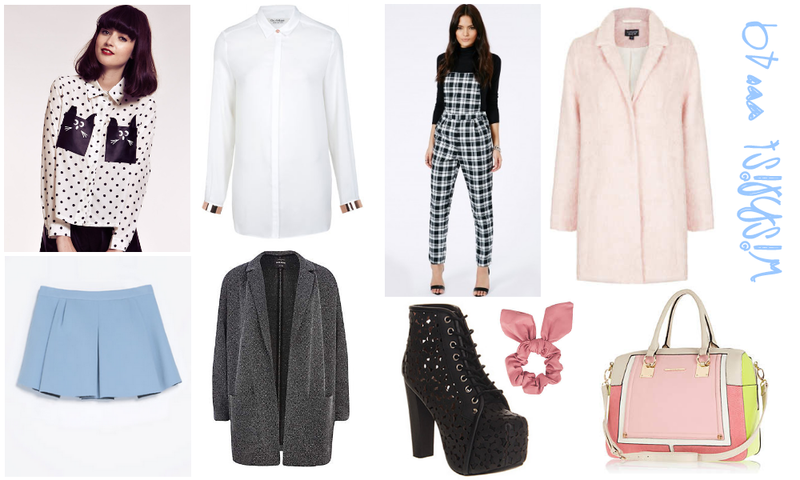 I've really been into the new trend on Miss Selfridge at the moment called Winter Pastels. It's a mixture of monochromes with pastel pinks and powder blues! I love it and this it's a really pretty, girly and smart trend. I'd love to create a winter pastel look or two in my wardrobe, and these pieces would make it perfect! Polka Dot Shirt with Cat Pockets - Just adorable. I need more shirts in my life if they're going to be like this. Cream Cuff Shirt - And this one! I love the simple colour with the detailed cuffs! Tartan Dungarees - I saw these a while ago on the Missguided website and thought they're just my perfect dungarees. I love the tartan and it looks really nice and fitted too! My sort of dungarees. Fluffy Swing Coat - A pink coat. So on trend right now and I may be a couple of months out when I finally get one, but I still really want one. I have this one in mind because it's fluffy, pink and really versatile to wear. Pleated Mini Skirt - I love a skirt, but I haven't bought a new one in a while. I love this one in the Zara website. I haven't seen this powder blue in a long time but I really like it! Whether it suits me or not is a different story though. Tweed Oversized Blazer - I need something like this in my life. The casual oversized blazer to dress down a smart outfit. JC Daisy Lita - These beauties appears on my Christmas Wishlist for this year, and I still love them! I think they'd go with so much and they're better than just plain ones! PU Bunny Ear Scrunchie - Too cute, something for when the hair needs to be popped up but still look cute. Pink Colour Block Bowler Bag - This bag is just beautiful. I love the contrast colour on the sides, and the shape of it too. It looks like it could fit everything inside! Definitely favouring this trend this season as well as the Highland trend too! What's your current favourite trend?